Today was a pretty busy day. We had mass followed by Open House for both the older boys' school and Lil' C's preschool. After that I had to run to the store to stock up on milk and fruit and after school snacks. When I was finally home, I had a choice to make. Did I start to clean the mess that was my house - breakfast still evident in the kitchen, piles of clothes, shoes and socks littered in the laundry room, various toys strewn all about. 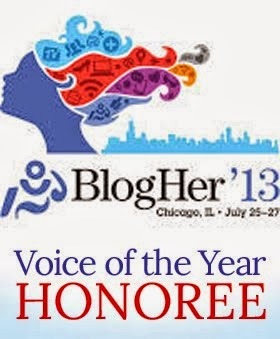 Or did I sit down with my laptop and troll Facebook, send some Tweets, and catch up on e-mail and blog reading? No, I decided instead to set my priorities. I put on my running shorts and tennis shoes and asked the boys if they wanted to go for a walk with me. Slim decided to stay home with Daddy and throw balls around the backyard, but the three others set out with me. We went for a great walk! In all, I walked/ran (remember 'cause that's what I do) and the boys scootered about two and a half miles. Halfway down the trail we chose, we came upon a small pond. 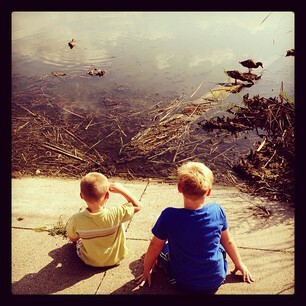 The boys could see ducks, so they asked if they could go closer. We sat for a long time watching the ducks bob for fish, wiggling their tail feathers in the air. We watched as frogs jumped out of the water onto a piece of driftwood. We counted the other sets of frog eyes peering out of the water at us. And we listened to the geese honk from across the pond. We sat for a long time, just watching and talking and showing Baby E all the animals. I thought about how this was the last day before school started again. Before Cub Scouts and soccer and speech therapy and homework and countless other obligations begin again. And I was really glad I asked the boys to walk with me. Even when they started complaining on the way home, I kept a smile on my face (we had walked a long way after all). To think I could have missed it. I could have been buried in laundry or tied to my computer trying to figure out more about SEO. No, it really is all about priorities. Tomorrow school starts, and my time with my boys will be significantly less. It will be more structured and, probably, a lot more stressful. Today was just what we needed as an unofficial end to our summer time together. I'm glad I had my priorities straight. The director of my sons' preschool is one of the sweetest, wackiest-in-the-cutest-way, soft-hearted people I've ever met. Every year she includes the same poem in the preschool parents' packet, and I just love it. It is the perfect reminder of what's really important. I've posted it before, but it bears repeating, today and often. Here's to a wonderful and safe school year for all our children!